(PhysOrg.com) -- With their discovery, the scientists Johan Lindgren, Per Uvdal, Anders Engdahl, and colleagues have demonstrated that remains of type I collagen, a structural protein, are retained in a mosasaur fossil. The scientists have used synchrotron radiation-based infrared microspectroscopy at MAX-lab in Lund, southern Sweden, to show that amino acid containing matter remains in fibrous tissues obtained from a mosasaur bone. Previously, other research teams have identified collagen-derived peptides in dinosaur fossils based on, for example, mass spectrometric analyses of whole bone extracts. The present study provides compelling evidence to suggest that the biomolecules recovered are primary and not contaminants from recent bacterial biofilms or collagen-like proteins. 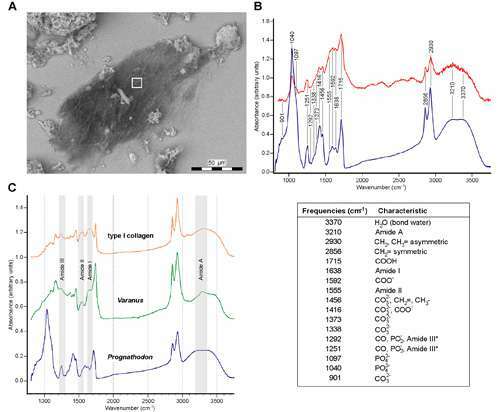 Moreover, the discovery demonstrates that the preservation of primary soft tissues and endogenous biomolecules is not limited to large-sized bones buried in fluvial sandstone environments, but also occurs in relatively small-sized skeletal elements deposited in marine sediments. A paper reporting the discovery, 'Microspectroscopic Evidence of Cretaceous Bone Proteins' is now available in the scientific journal PLoS ONE. Mosasaurs are a group of extinct varanoid lizards that inhabited marine environments during the Late Cretaceous (approximately 100-65 million year ago). Collagen is the dominating protein in bone. The scientists have applied a broad spectrum of sophisticated techniques to achieve their results. In addition to synchrotron radiation-based infrared microspectroscopy, mass spectrometry and amino acid analysis have been performed. Virtually all experiments have been made in Lund. At MAX-lab, the experiments have been conducted at the MAX I ring, beamline 73. Is it in any way possible to extract any DNA from the specimen? "One of the most well preserved mosasaur sculls in the world" - hmm...wonder what the difference is between a "scull" and a "skull"? I thought "sculling" had to do with the movement of a fish or boat hull through the water. Tis best to accept and move on.